Last week we received news that our grant application, submitted to the Natural Environment Research Council, has been successful and will be funded. 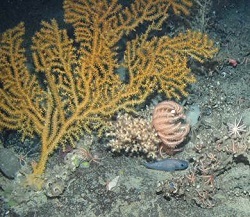 The project entitled “The influence of population connectivity on depth-dependent diversity of deep-sea marine benthic biota” brings together teams of researchers from both Plymouth University’s Marine Institute and Oxford University’s Somerville College, with the Joint Nature Conservation Committee as partners, in a three year project to investigate deep-sea population connectivity. The research programme starting in early 2015 will focus on the NE Atlantic banks and seamounts, and will deliver information that will help us to better manage the deep sea ecosystem. So why is deep-sea population connectivity important? Well species populations are connected to each other through both movement of adults (migration) and eggs, larvae and juveniles (dispersal). If populations become isolated from one another (i.e. are no longer connected), then through genetic mutation, drift and natural selection, they may become so different that they evolve into new biological species. Understanding how populations become isolated is critical to understanding the process of speciation. In the marine environment many species do not move as adults (e.g. corals) or move very slowly (sea urchins). This means that for different adult populations to remain connected they rely on dispersal of early life history stages. Most marine species have a larval stage that lives in the plankton for a period of time, moving with the currents, before settling in a new area. It is larval dispersal that keeps distant populations connected. So understanding patterns of larval dispersal is important to understanding connectivity. From a conservation perspective, understanding how populations are connected is critical to effective management of those populations. If a population becomes isolated it is far more vulnerable to extinction. If there are no new larvae coming into the population from outside then there are none to help build the next generation, act against problems with inbreeding, and help restock the population if it should suffer some catastrophe. This is really important when thinking about designing Marine Protected Area (MPA) networks. We need to understand where the larvae come from to support our protected populations inside the MPA, and also where larvae coming from inside the MPA go to. That way we can better understand if and how our MPA is working to protect a population. This project will investigate population connectivity in 3 ways. First we will use population genetics to look at how related populations are between banks and seamounts (a bit like we use DNA fingerprinting to check if a child belongs to a parent). This will tell us which populations are most related to each other and so are more connected. Second we will use models of ocean currents to predict where larvae from one seamount will travel, and see which other populations the larvae might reach and thus be connected to. Third, we will look at the range of species found at different seamounts and banks to see if some seamounts are more similar to others in terms of the kinds of species they have. Just to complicate the issue, we are also going to investigate if and how connectivity changes with depth. What we hope is that these three ways of looking at connectivity all tell the same story; That is to say we hope to see that seamounts that have a more similar range of species, are more likely to have flow of larvae between them, and have more genetically related populations. Our research cruise to collect samples is due to go out in summer 2015. We are really very excited about this project and will keep you posted.